Monday July 16th 2018, Voku-Benefit for Climate Justice & short info-talk Code Rood. Volkseten Vegazulu, 7pm. Elke derde maandag van de maandag van de maand. Een volkskeukenbenefiet voor klimaatrechtvaardigheid in Joe’s Garage. Onder andere voor de gemaakte kosten bij de Wij Stoppen Steenkool actie in de Rotterdamse haven van afgelopen 9 maart. Met een kort praatje over de Code Rood actie en het klimaatkamp in Groningen van eind augustus. Een ideaal moment om kennis te maken met mensen die betrokken zijn bij de klimaatbeweging en Code Rood https://code-rood.org/. Vanaf 19:00 open en natuurlijk met overheerlijk veganistische maaltijd! Every third Monday of the month. A benefit for climate justice in Joe’s Garage. It is for covering the costs of the Wij Stoppen Steenkool action in the harbour of Rotterdam. There will also be a short talk on Code Rood, the planned action and camp in Groningen of late August. An ideal moment to get to know people that are involved with Code Rood https://code-rood.org/ and the climate movement. Open at 19:00 with a vegan meal on donation. IT’S CODE RED FOR GRONINGEN AND THE CLIMATE! Gas must stay in the ground and all the earthquake damage needs to be compensated. But the NAM, Shell and Exxon keep on pumping. And the government is allowing this to happen. THAT IS WHY WE ARE DRAWING A LINE: from the city to the countryside, from Groningen and beyond, we are joining forces around Groningen’s liberation day on the 28th of August. With the first mass action of civil disobedience in Groningen we are sending out a powerful signal: leave the gas in the ground! Everyone can contribute, experience is not required. 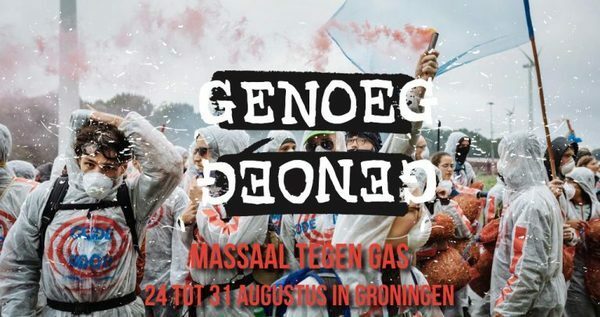 Together with people from Groningen, Code Rood is also organising an ACTION CAMP IN GRONINGEN from 24 to 31 August. Here, we will offer a wide programme of workshops, trainings and open discussions about gas extraction and a fossil free world. And in the evenings there’ll be a campfire and music. You can stay at the camp overnight, or drop by for a day visit.